Saturday 7.30 am. Quite sea and blue sky. It Sems that it was going to get an amazing day. My colleague was interestingly special on that day. He just told me to be in the Lobby of our Hotel at 7.45. As it was a surprise of my colleague Daniel I had no idea what was expecting me. The day began early, but afterwards it was really, really worth to constrain oneself out of the heavenly bed ;-). We got picked up by a black mercedes van and drove along the bosphorus. A very friendly guy hopped on and told us that the sea is calm and the weather is perfect for us, so I slowly got a plan what was going on. When we arrived at the waterfront there were three little fishing boats and Mr. Ilger was joking about the old Fisher boats in front of us. I didn't hesitate and said kiddingly the yacht behind those little ships would be something for us. In the end it truly was our boat! We were the first bloggers on board this beautiful boat and had the chance to see Istanbul from it's most luxurious side. The skipper helped us on board and introduced us to the captain. 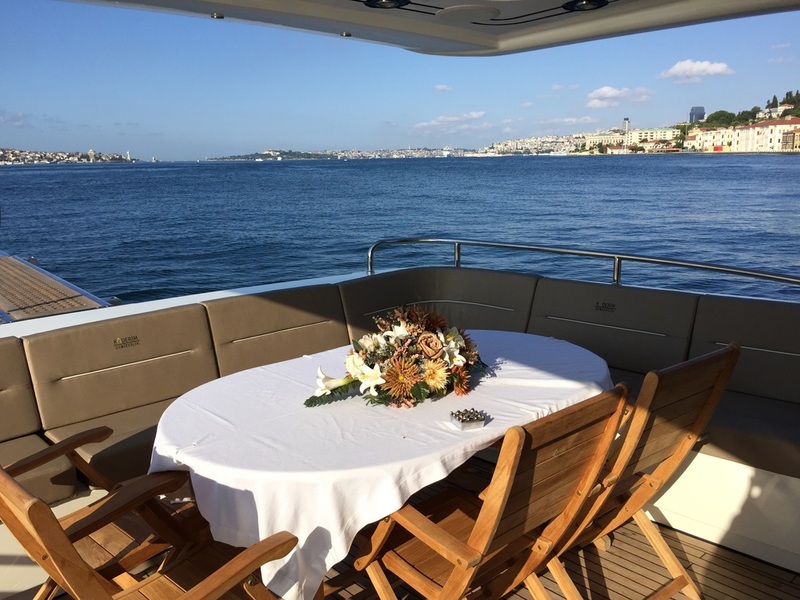 Mr. Ilger, the owner of Luxury Istanbul, told us that this is their mid-class yacht, which can welcome groups or Weddings. The company also had other boats for up to 150 people which is quite huge! We decided to sit at the deck where we could gather the best views. The trip took one hour and first we drove along the European side to see the palace and all the beautiful hotels at the Bosphorus like the Shangri-La, the Four Seasons or the amazing Ciragan Palace. The way back was along the Asian side where the upper class of Istanbul have their amazing private houses. The army school and another palace was close to the big bridge. The Bosphorus is about 32 kilometers long and connects the Mediterranean sea with the black sea. Before er returned to the land, we made a turn towards the old town and we could glimpse the Hagia Sofia and the Blue Mosque as well as the Light Tower on a small island between Asia and Europe. After this amazing trip we said goodbye to the crew and the driver brought us back to the Ritz Carlton where we were ready to have breakfast. We were guests of Luxury Istanbul. All above written expresses our own opinion and has not been influenced.